Should an Entrepreneurial High Schooler Go to College? I’m a high school senior. Over the last two years, I’ve built a very successful lawn care business in my neighborhood that filled up my entire summer this year. I will make about $35K this year and I can make a lot more once I graduate. My grades are good and I got good scores on the ACT and SAT. I applied to a few colleges and got accepted to all of them, but I only applied because my mom pushed me. 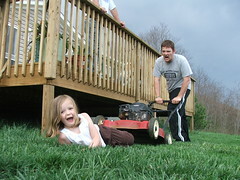 What I really want to do is build my lawn care business after I graduate. My dad sort of agrees with me but my mom demands that I go to college. What do you think I should do? This is one of those situations where you’re going to have loud, strong proponents on both sides of the decision. Some people believe ardently in the value of a college education – others see the value in a strong entrepreneurial opportunity. Successful businesses require a mix of drive, talent, and luck. Andy already has all three. Andy wanted to build his own business and had the drive and desire to actually get up off the couch and do it. While his friends were busy with their X-Box 360s, Andy was building a $35K business – that takes initiative. In order to make $35K from a part time lawn care business, Andy must have stumbled upon a niche and filled it well. That’s a business opportunity that doesn’t come along all that often. Every day, as a small business owner, you’re called upon to make difficult choices. It takes raw talent to consistently make the right ones and build business. Andy’s obviously got that talent. Andy has the natural drive to start his own business, the luck to stumble upon a niche that needed filling, and the talent to grow that business into something impressive. That’s a combination of factors that doesn’t come along that often, and Andy needs to take advantage of the situation. I speak from experience here: college is a life-transforming experience. It is truly an opportunity for you to figure out your beliefs, learn new things, have countless compelling experiences that are almost impossible to replicate outside of college, and get an education in an area you’re compassionate about. Not only that, it comes at a point where your mind is most open to such diverse experiences – early adulthood. Andy shouldn’t let that opportunity pass him by. He can always return and get an education later on, but the full growing experience won’t be as open to him. He has the seed of a small business in place, sure, but he can keep that business going during the summer while attending school, plus he can use the business income to pay for his degree. Plus, if Andy chooses to major in business, he might find yourself walking out of school with a brilliant plan for transforming your the mowing business into something truly amazing. College doesn’t have to mean giving up that dream. I think the real answer resides within Andy himself. Andy, are you truly happy mowing cemetery lawns, fixing lawnmowers, handling invoices, and so on? Do you have a desire to keep pushing the pedal to the floor, growing the business, eventually hiring employees and advertising to build a bigger and bigger client list? Either these thoughts will excite you or they will fill you with unease. Be truly honest with yourself. This is one of the biggest professional choices you’ll probably ever make. If you can’t imagine anything better than building this business you’ve started, then go for it. Throw all your gusto into that business and make it grow. Along the way, save most of what you earn – put it away so you can walk away from the business at a fairly young age. If you’ve built the business into something large and successful and sell the whole thing at age thirty, you can go to college then if you want to. On the other hand, if growing the business doesn’t excite you and you just want to mow lawns, go to school. You can still spend your summers (and lazy weekends in the spring and fall) mowing lawns and maintaining your business as it is. You can use that income to pay for your education and when you graduate, you’ll still have your small side business to do with what you wish, plus a paid-for college degree. You already know the answer, Andy. It’s inside of you. Ask yourself that honest question: is building this business the thing you really dream about? Let your answer guide you. One final point of advice: if you do decide to go with the business, save your money. Spend as little as possible and sock the rest in the bank for later. If you decide in two years that you want to go to college instead, it’ll be quite easy if you’ve been banking your cash.